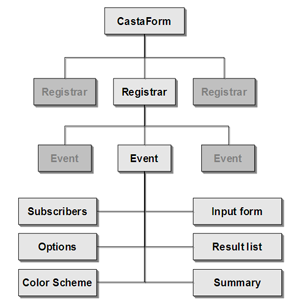 The basic element in CastaForm is an Event. The definition of an Event is broad (you could also just call it a database), and can range from a simple guestbook or condolence register, to a registration form with multiple options, checkboxes and drop-down lists. On-line payment for events is supported through PayPal. An Event is an input form, a set of rules about the event (Event Options, Color Scheme), together with a set of entries (submissions) to that form. An Event is created, maintained and owned by the Registrar of that event. One Registrar can own more than one Event. You become a Registrar by Registering to CastaForm and create an event. Submissions are made by either people on the internet, or by the Registrar himself. The Registrar can grant special privileges by designating a Power User, who inherits most of the rights of the Registrar, except for modifying or deleting the Event. The visible parts (at least for the Registrar) of an event are the Input Form, the Entry List and the Entry Summary. You, as the Registrar, control who can see what. You can hide any of these three items, so even the input form itself, in the case that the Registrar (or Power User) is the only one who submits to the event, but want users to see results. The Input Form is the basic interface to populate your database with information, either by contributors on the internet, or by yourself. You are in control of colors, captions and the overall design (or just pick from a template). The layout of a form can be changed through the Form Editor. Input controls can be text boxes, email fields, image upload fields, file upload fields, country selectors, text areas and drop-down controls and radio-buttons. You can either set inputs to required or not, or set it to required based on a value entered in another field. The Form Editor allows as well for the insertions of formulas, which can replace fields in a string with actual values of a field, or to calculate numeric values. The Entry List shows the data in your database. You can define who may see this list (nobody, everybody or only contributors to the list), how many records you want to show on the page, which fields to show to the public and the default ordering. Listings can be sorted by clicking on the column headers. Last but not least this page contains search options and a download link (if the Registrar or the Power-user are logged in) to import your data in, for example, a spreadsheet program. The Entry Summary lists some basic statistics about the entries. Data can be broken down by discrete inputs on the form, like the choices from drop down boxes, radio buttons and checkboxes. Columns can be sorted by clicking on the columns headers.